"I made this recipe up on a whim because it sounded good. This is a quick recipe for a busy person who doesn't have the time to spend in the kitchen. Less than 5 minutes to prep, the rice cooker cooks it in about an hour, and it will keep it warm without scorching for several hours. I have a large rice cooker that has a steamer basket with it. You can add sweet corn to the mix. Top with chicken or mix in ground beef, pork, or venison. Very versatile. Serve with sour cream, salsa, and tortilla chips. My kids love this meal." 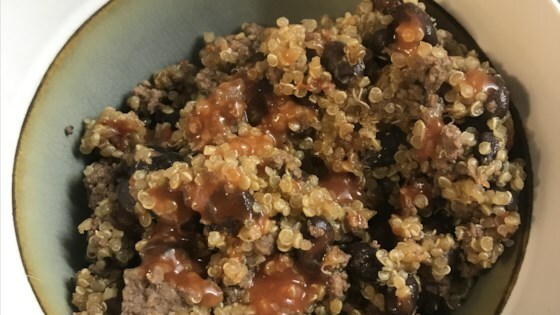 Mix black beans, diced tomatoes with green chile peppers, quinoa, water, and taco seasoning together in a rice cooker. Cook quinoa mixture on the "brown rice" setting, about 1 hour. Very easy to make and customizable! Thanks for the instructions!